I say this every time that my kids and infact our whole family love Hi-5. This quality kids show never fails to entertain and the vibrant colours, songs and dances are guaranteed to your kids from being couch potatoes when watching the show. I'd have to say that rare is the occasion that my daughters would just sit there and not react to what they were seeing on the screen. In this adventure, the gang take us on an animal filled adventure filled with songs and laughter. This show is a simple learning experience that the kids love and it's not too much for younger viewers to take in and enjoy. The nice thing is that even if it is too much for the young ones, they will still love the songs and the fun that it looks like Hi-5 are having. Add to that the simplicity of some of the sets and locations, you and your kids can easily copy the fun onscreen at home, making your own animal ears and tails. Some of the sets were of a farm, the bush and on horseback in the mountains. The kid's imagination will run wild with this disc. Something that parents will love about this DVD is that the menus have been specially designed to be child friendly and are very easy to navigate. Even my three year old could identify where she wanted me to click to make things happen. 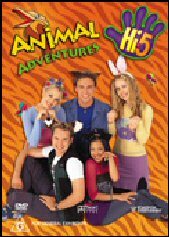 Hi-5 discs are always of quite high quality and as such they always score very well. The emphasis is always on fun, learning, friendship and sharing and that's the way it should be. I can highly recommend this Hi-5 disc without hesitation as being a interactive experience that your kids will love. Stereo Audio. No audio problems on this disc. Karaoke feature. Take it or leave it, my kids did not get into it. Maybe older viewers would have a crack at it.